On July 29th, Italian gothic doom metallers The Foreshadowing will release their fourth full-length, Seven Heads Ten Horns, via Metal Blade Records in North America. For a preview of the album, fans can hear the new track, “Fall Of Heroes”, now via DecibelMagazine.com. The lyric video for the previously released single, “17″, can also be viewed at: metalblade.com/theforeshadowing – where the record can be pre-ordered in various formats! Formed in 2005, The Foreshadowing gained popularity in the international gothic doom scene with their three acclaimed albums released between 2007 and 2012: Days of Nothing (2007), Oionos (2010) and Second World (2012). In 2013 (after performing at some of the most prestigious festivals in Europe), The Foreshadowing toured North America for the first time with Moonspell, Marduk, Inquisition and Death Wolf – which only furthered the band’s success in the States. Upon concluding their worldwide touring for Second World, the six-piece started writing their next opus – entitled Seven Heads Ten Horns. 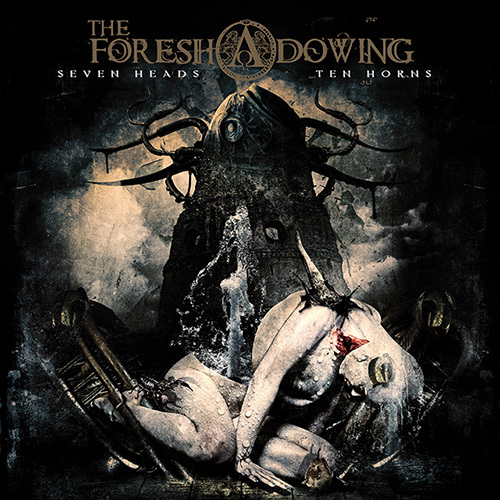 Produced and recorded by The Foreshadowing at Outer Sound Studios, Seven Heads Ten Horns was mixed and mastered at Hertz Studio (Poland) by Slawek and Wojtek Wieslawski and features artwork by Siro Anton (Septicflesh). The nine eerie tracks found on the album will take listeners on an abysmal journey from the past to the future of humankind – which promises to once again please fans and critics alike!